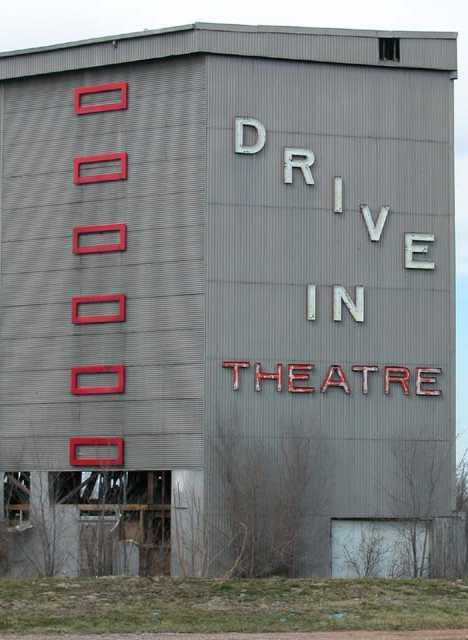 The 600-car French Village Drive-In in East St. Louis, Missouri epitomized the state-of-the-art of drive-in movie theaters when it opened in 1942. Fifty years later when the drive-in closed, both East St. Louis and America in general had gone through a whole lot of changes, not all of them positive. Demolished in late 2005, these images hosted by the Preservation Research Office illustrate the much-faded glory of a very unique drive-in theater. The gray corrugated aluminum walls of the screen’s superstructure were designed with enough depth to provide dressing rooms and prop storage areas for live performers who entertained the drive-in crowds on a narrow stage extending out from the lower front lip of the screen. When Flickr user JoshBerglund19 visited the decrepit Chief drive-in theater just a few days shy of the end 2006, he must have been overwhelmed with a sense of emptiness and loss. 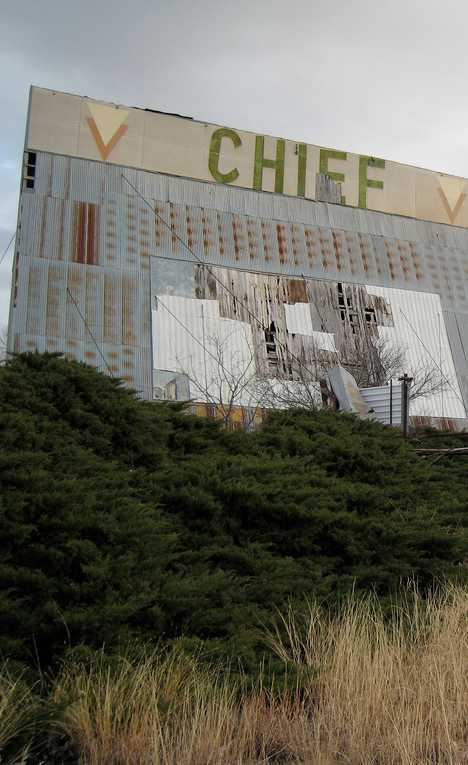 The Chief, located in Carey, Texas has been abandoned for some time – that tree’s been progressively blocking the right side of the screen for years. Our intrepid explorer bravely put away his qualms and instead got to work with his camera. How many abandoned drive-ins still have the projectionist’s chair and the projector itself standing much as they were after the last show ended? Moreover, just who were the Chief’s paying customers considering the arid Panhandle town had a population of only 60 in the year 2000? The concrete & brick remains of the redundantly-named Auto Drive-In in Titusville, PA provide a heapin’ helpin’ of history for both drive-in devotees and ghost sign geeks. Located along State Route 8 in Cherrytree Township, the Auto Drive-In opened in the early 1950s and switched over to adult entertainment in the 1970s. By the early 1980s, even this last saving grace failed to keep the bills paid and the operation closed shop. The survival of the Auto Drive-In’s screen to the present day is due to its construction: it was built like a brick house because it WAS a brick house! 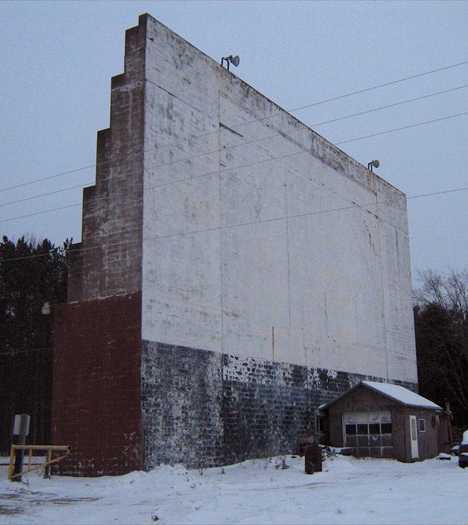 It’s unknown whether the theater owner and family actually lived in the screen or if it was only used for office space and storage but one kinda hopes it was the former… about the only thing that beats living in a drive-in movie screen would be living in a lighthouse. Of course, such enjoyment would depend somewhat on whether the person or persons living in the screen HAD a family, and if the theater showed family films. Awkward. At one time there were roughly 4,000 active drive-in movie theaters in the United States but beset but factors ranging from the introduction of the VCR to suburban encroachment on their expansive real estate, that figure has declined to around 350. 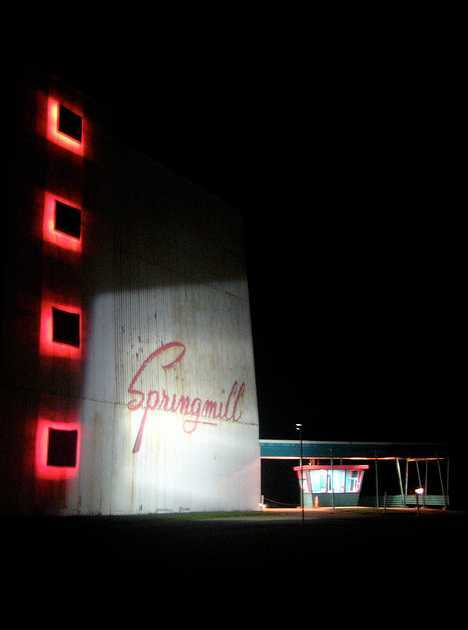 Add one more: the legendary Springmill Drive-In in Mansfield, Ohio is set to shut down later this year – it opened in 1958. Roll the credits, and don’t forget to hang the speaker back on its pole before you leave.